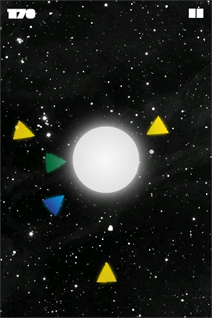 a simple yet challenging game where you tap the approaching alien invaders (various colored triangles) to prevent them from crashing into your sun. the trick is that each invader has a different tap requirement (from one to three), plus you have bomb power ups to clear the screen all at once. just one crash into your sun though and the game is over.